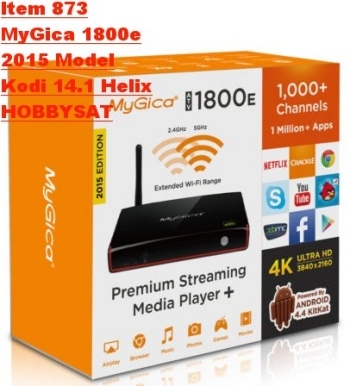 The new shipment of MyGica media Players has arrived. Hard to keep these in stock! 1800e latest model. Kodi 14.1 Helix. Android 4.4 KitKat. Extended Wi-Fi range 2.4, 5 GHz.4K Ultra HD 3840x2160. Bluetooth. Optical Audio. Quad Core. 2GB ram. 16GB Flash Memory. 4 USB Ports. HDMI Port. The NEW awesome Super Small KR-40 keyboard remote. Those with a rain check on more quad core 1800e machines please reply here so we can get them to you today.